Our little H has just started pre-school, which I’m sure is nothing too major on the whole grand scheme of things – but to us, and to H, it’s the exciting next chapter in her story. 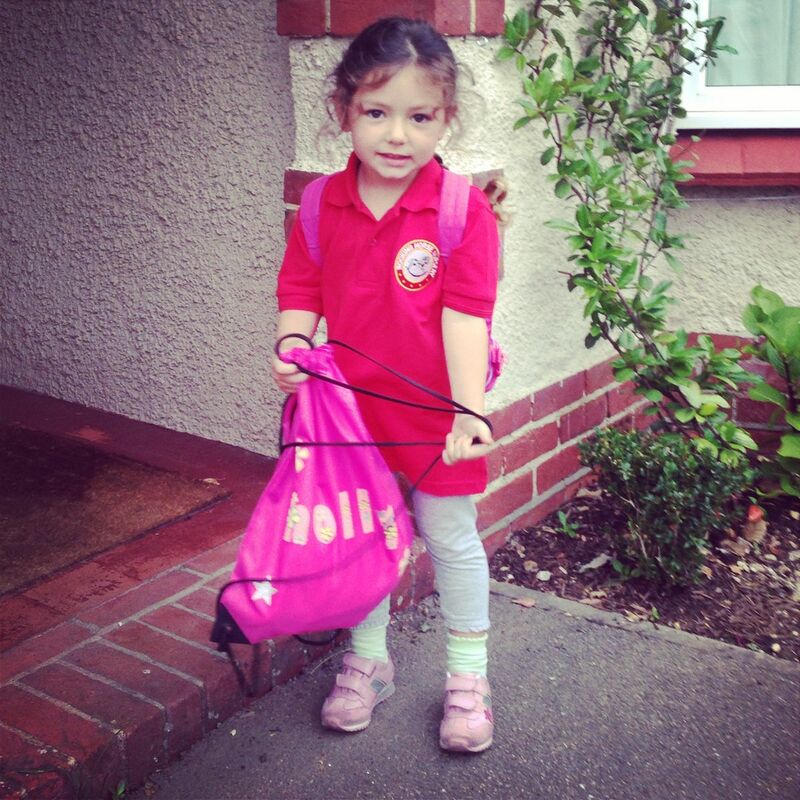 As things go – I think we’ve been let off pretty lightly really, as our pre-school is attached to the very same nursery that H has been attending since she was only about a year old. So the transition was a very smooth one indeed! Her new room is just along the corridor from her previous room; the staff are the same recognizable faces from her previous terms; and she will still be sitting alongside her lovely little friends who she’s grown to be so fond of over the last years. So for us as parents – this was pretty much our normal routine. If however she were attending a new pre-school on a different site, I’m certain that the situation would have been an entirely different one, to both us as parents and to little H, as our growing girl. All throughout our recent holiday she was saying how excited and eager she was that she was going and kept chanting…..
……merrily, at the top of her voice whilst bobbing around in the swimming pool! We thought this was very cute! It wasn’t until that first time she put on her little red rugby top, complete with the pre-school emblem, when it dawned on us that this was rather a momentous occasion in our little household. Our first child, our first daughter has grown from a tiny little bundle which we carefully and apprehensively cradled as we walked out of the hospital, to a happy and fun loving little girl; full of character, laughter and back-chat!! I dread to think what I’ll be like in a years’ time when she starts school!! I was very pleased also that I’d managed to get her a really cute little drawstring gym bag which had her name on it. As we’d only returned home from holiday a couple of weeks ago, unfortunately H was a teensy bit late to start, but so far she seems to have taken to it like a duck to water. The only real difference being that she wears a rugby shirt and jumper as a sort of uniform. Also, I was told by the staff that on her first day at lunchtime, whereas all the other little girls and boys had learnt to stand behind their chairs before being asked to sit down for lunch – H just ploughed on in there and was perched on her chair and practically tucking in to her food before the others had probably even had the time to visit the toilets to wash their hands!! She must get that from Daddy!! Though, the next day she had come to learn the new ‘pre-school’ ways and had settled in nicely. It was also her turn to do ‘show and tell’ to the rest of the class. This happens on a weekly basis to get them used to being able to interact, communicate and stand up and speak openly to a group of people, which I must admit I think are all great learning lessons and tools for later down the years. The item she took in with her (probably persuaded by myself and Mr B as we thought it was easy to explain) was a brightly coloured ball – which expands and contracts when you throw it. It was one of the playthings we bought her whilst in Greece, so we also thought it’d be nice and fresh in her memory. I heard from the staff that all had gone really well – as I also had concerns over her stammer (read here), so I was really very pleased and relieved to hear this feedback. Though – since showing the ball – she absolutely swears blind that she never took the ball in and she certainly didn’t stand up and talk to her classmates about it! As much as we’ve said to her that she did, and the teachers all said that she did – she is absolutely adamant that this did not happen!! Flummoxed is not really the word! Today she has taken in Pudsey – a treasured cuddly toy dog (thank you Ikea!!) – so fingers crossed she remembers it this time!! And next time she says she wants to show her sister!!! We’ll have to wait and see about that one!!! Does anyone else have any funny ‘Show & Tell’ stories?? Previous Post Being a mummy is …….. sometimes far from glamorous!!! This is definitely a major milestone for any child – and definitely one to be noted and celebrated! My kids have always loved doing show and tell – with my oldest in particular there’s no stopping him once he starts.